06 Manual Combat Folder, Serrated. 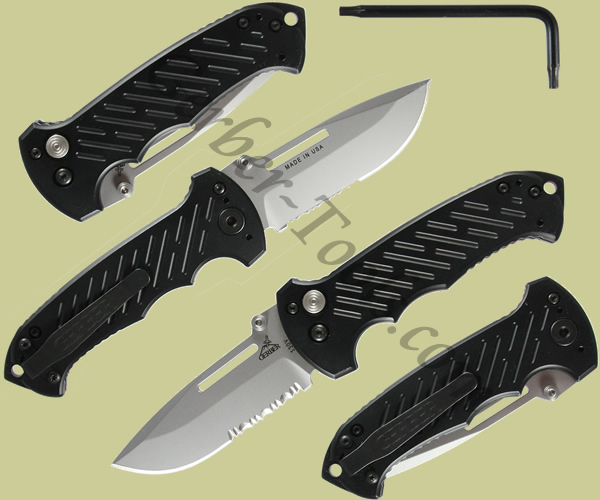 The Gerber 06 Folder 30-000308 is designed with military personnel in mind. The handle has deep finger grooves for secure gripping, and it features a strike plate and lanyard hole on the pommel. You will find the plunge lock on the handle. This feature allows easy closing of the blade while wearing gloves. The S30V steel blade is a partially serrated drop point with dual thumb studs for ambidextrous opening capabilities.